Are you ready for true luxury? 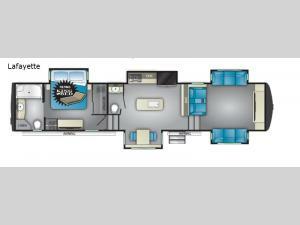 Well come step inside this five slide out Landmark 365 Lafayette fifth wheel. In the front there is an entertainment center plus plenty of seating for your family including theater seats. The island in the kitchen features extra counter space for meal prep plus a large sink. Located off of the kitchen is the convenient half bathroom, and in the rear you will find the spacious master bathroom. This model has even been prepped for a washer and dryer so now you can easily keep up with your laundry if you choose to add the optional washer and dryer!